If you’re at your wits end trying to manage your food cravings and 3pm junk food crashes, then here are a few tips for you. Have you noticed how you can’t ‘get away’ with eating (and drinking!) like you did, maybe in your 20’s and 30’s? A plant-based diet is not a diet of vegetables alone. It is a diet based on fruits, vegetables, whole grains, and legumes, which may exclude or minimise meat, including chicken, dairy products and eggs. The diet will definitely exclude foods made from refined flour and sugar, and certain refined vegetable oils. I advocate a completely plant-based diet, excluding all animal products, because of the multiple health issues related to animal products. Lose weight and keep it off eating real plant foods. 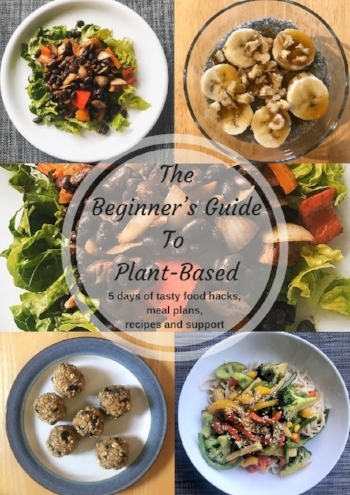 My Beginner’s Guide to Plant-Based is 5 days of tasty food hacks, meal plans, recipes and support. Start your journey to healthy plant-based eating today!